Searching For a Reliable Painting Contractor in East Ridge, TN? Do you need the assistance of an East Ridge painting contractor? If you do, then you’re going to have to contact Williams Painting Company. We have been power washing homes and making them gleam with bright new colors through our painting service. Don’t miss out on yours. Call us today for more details. Trying to find a painting contractor can be a very frustrating event. There’s lots of questions that you need to ask and many interviews to go through until you find the right one. 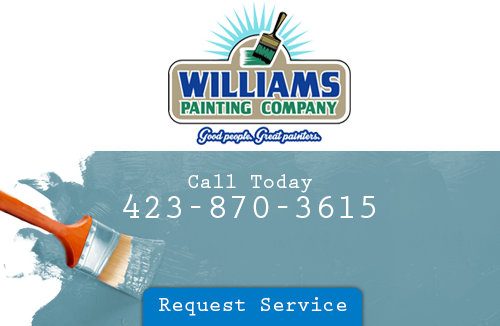 You can always go with the services of Williams Painting Company as we have over two decades worth of experience. Our work speaks for itself. A reason why you should hire a professional painter is that no paint will be wasted. It will take a lot of paint to coat your walls, but a professional knows just how much to use as waste will be at a minimum. You won’t be faced with the dilemma of using too much paint of wasting any for that matter. You’ll love the painting service that you receive from Williams Painting Company as they’ll be no sloppy messes. You won’t have to deal with an amateur painting company that spills paint all over your flooring. We’ll take care of the clean up as well. Any house painter knows that good interior painter takes their time and will get the job done right and to perfection. Your East Ridge house painter is just waiting to hear from you at Williams Painting Company. If your walls could speak they’d say that you’ve been neglecting them. If you haven’t paid any attentions to them in some time, then maybe now’s the time to do something better for them. Interior paint will bring your room back into lime light. Great interior painting starts with a good house painter. When you have a good house painter that’s willing to go the extra distance for you, then that’s the one you should keep on your speed dial. You can’t go wrong with our interior painting service. Pressure washing your home on your own can be nothing but one big back breaker. Trying to get every little crevice of your home tends to be more than frustrating. But wait! Williams Painting Company has the answer-we can do the pressure washing for you. We’re the East Ridge pressure washing contractor that’s going to see the job the entire way through even the aftermath. Our painters use a safe and gentle solution that’s not going to harm your home. You can always trust that we’ll do a A-1 performance. Thanks for doing the painting in the house for us. It saved me a lot of time and should enable us to get the house on the market much faster than I could have done myself. If you are looking for an East Ridge painting contractor, please call 423-870-3615 or complete our online request form.